Dedicated to Salsa (including Mambo, Cha-cha, Afro-Cuban, Puerto Rican, and Latin Jazz music). Essentially, the beloved rhythms that have captured the hearts and minds of music lovers around the world for almost 100 years!. There are plenty of venues out there, that are not particularly devoted to salsa, even if they say that they are. Salsa as a genre is being severely threatened. If you truly love this music, then you need to really support it. If not, it will disappear. Think about that. What would life be like if you could never enjoy salsa dancing again? That could be where we are headed unless we do something. The fear of salsa disappearing is what made me create "The Salsa Empire". Please come out and finally enjoy yourself in “Strictly Salsa” events where you can dance to your heart's content without having to put up with other formats while you are waiting for a salsa song to come back on. Salsa Empire was started by Nancy Alonso, "The First Lady of Salsa". SATURDAY NIGHT SALSA -- Often times, people tell me they would go salsa dancing more often if it were on a Saturday. Well, the time has come, mi gente. 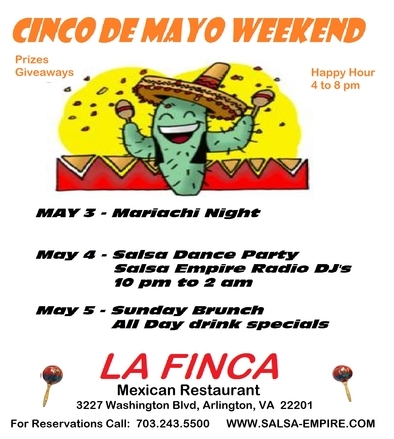 La Finca Mexican Restaurant in Clarendon has opened its doors to us. Let’s show this new establishment that the Salsa Community is as strong as ever and worthy of a Saturday night. Come out and have some great food and then dance the night away to the best Salsa, (and you know when I say Salsa, I mean it!) What else are you gonna do, watch TV? 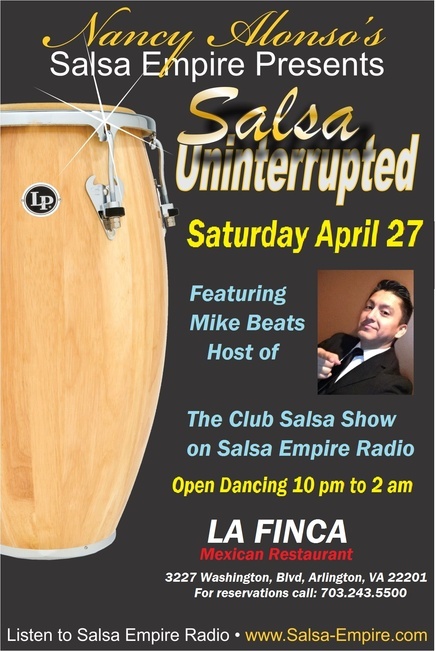 A very special night of Salsa Dura with the non stop music of Mike Beats, the Host of the Club Salsa Show on Salsa Empire Radio. 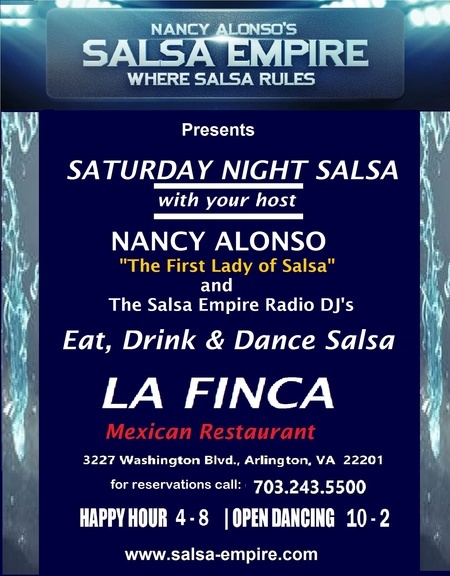 Your host for this evening is Nancy Alonso "The first Lady of Salsa. No Cover - No Exhibitions - No Lessons. This event is sponsored by Strictly Salsa Events on Fb. 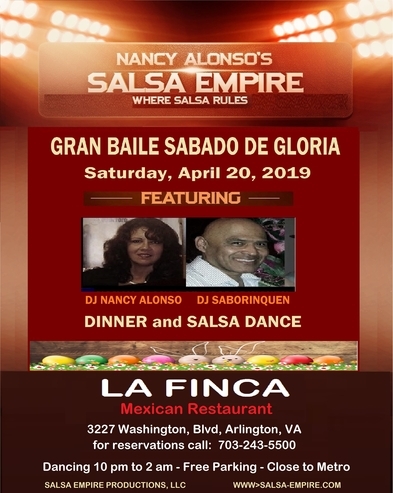 La Finca and Salsa Empire's "special" Saturday Night Salsa event "Gran Baile de Sabado de Gloria" in Clarendon this Saturday night with DJ NANCY ALONSO "The First Lady of Salsa" your host and featuring DJ Saborinquen "The Silent Assassin" taking turns on the wheels of steel. Uninterrupted Salsa Dancing and NO COVER CHARGE Come for dinner and stay to dance 10 pm to 2 am. Just a short walk from the Clarendon Metro station. Free parking in the adjacent lot.